It doesn’t take long for a synchro swimmer to start talking a new language at home! Does this sound familiar? : “Hey Mom and Dad! Today I learned how to scull to hold a vertical so I can one day do a nice hybrid. And I’m really tired from all that eggbeatering! What’s for dinner?” The language of synchro! In this first of two parts, ANA Synchro demystifies the terminology used in our sport for its most basic moves. Our youngest athletes start learning these techniques right away for a solid foundation from which to grow. 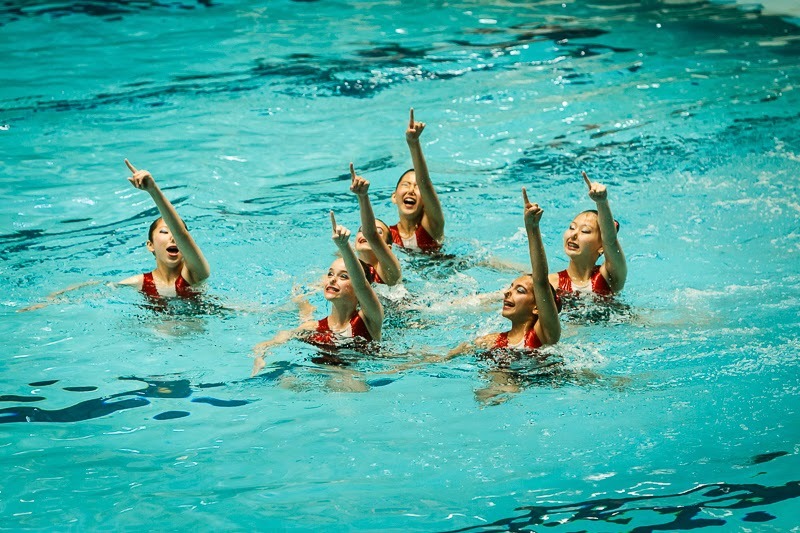 And our most experienced athletes continue to strengthen their basic techniques so they can more effortlessly do the more complicated and flashy synchro moves. Eggbeatering under the water allows athletes to perform artistic movements above the water. Eggbeater - the alternating, circular movement of the legs that keeps a swimmer’s upper body steady and out of the water during a routine. Some people may think it is simply “treading water,” but it requires much more core than ordinary treading and involves a specific technique – just like the motion of the eggbeater in your kitchen – that allows for athletic and artistic movements above the water. Athletes accomplish the difficult vertical position by support sculling underwater. The Ballet Leg Position - athletes are laying on the water with one leg perpendicular to the surface. Leg - a position where the swimmer is ‘laying’ on the surface of the water and one leg is perpendicular to their body. Requires flexibility, core control, and strong sculling technique. Anyone who doubts whether synchro is hard should try a “simple-looking” ballet leg next time they’re in the pool! Athletes spend much time working on figures because they account for 50% of their score at competitions. Figures - a collection of the most basic moves of synchro which are performed in a very slow, controlled fashion in competitions. Figures are important to practice because they account for half of a routine’s final score at a competition. There are 8 different figures for each age group, and they get progressively more difficult as girls get older. Hybrid - a sequence of leg movements performed while the swimmer is underwater in a routine. A typical hybrid can last 10-15 seconds, with the most challenging lasting about 30-40 seconds. 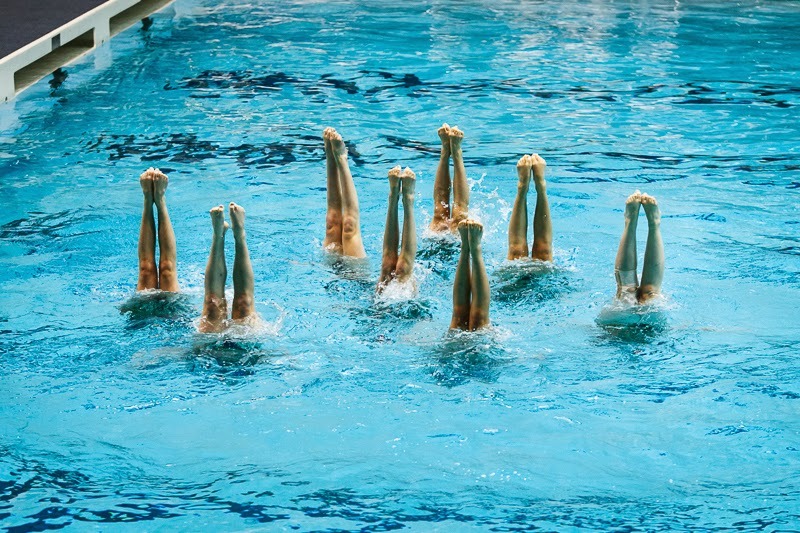 Hybrids, especially long hybrids, require synchronized swimmers to have a high aerobic capacity as well as flexibility, core control, and strength to maintain muscle control throughout the movement. Readers – are there other synchro terms that you’re wondering about? Write to us in the comments section below or send us an email to synchroana@gmail.com, and we’ll try to feature them in an upcoming blog! And stay tuned for Part 2 of Synchro Terminology where we’ll define terms used in synchro competitions and performances.